Whether you’re ready to embark on an applicant tracking system implementation project or still in the process of ATS vendor selection, now is the time to gather information internally so that you may set yourself up for a relatively quick and extremely effective implementation experience. While the software partner you choose will obviously have a significant impact on your experience, the extent to which you are prepared, attentive and responsive is paramount in your journey as well. The key is to clearly visualize your desired recruiting experience, from both the internal stakeholder and applicant perspectives, and then document the details required to execute upon that vision. Having this information prepared and in an organized format from the very start of implementation is the formula for a painless process…and more importantly, successful internal user adoption. 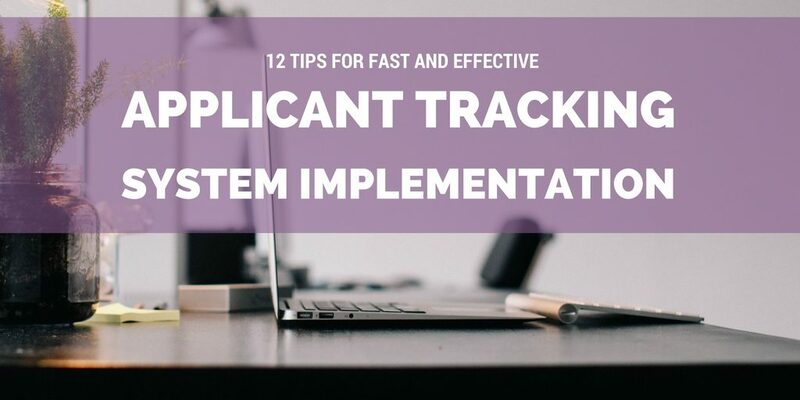 In this blog, I’ll highlight twelve examples of the recruiting process details you should be thinking about in order to have an optimal applicant tracking software implementation adventure. If you haven’t previously used any kind of ATS, then this point isn’t as important. However, if you are moving from one system to another, then consider how you want previous applicants handled (for ex., should they be imported into the new portal–typically for an additional fee) and whether all of your existing job descriptions should be uploaded into the new system. Your decision will be impacted by the extent to which you wish to source candidates from an existing passive applicant pool, as well as the frequency with which previous applicants return to apply to new jobs on your site. Also, you may find that some of your job descriptions need to be reviewed and adjusted before they are moved from one application to another. 2 – How much access will other users be granted? The number of users you wish to provision in your applicant tracking system should be affected by the culture of your organization, the tech savviness of your hiring managers, and the extent to which HR/recruiting does any application/resume pre-screening before involving managers in the hiring process. Most systems will allow for various levels of user access, and so this may encourage you to grant more individuals access knowing that you have the ability to restrict their access to certain aspects of the software. Think about the areas that should be accessed by your hiring managers, as well as the business units to which each of them should be attached. This will ensure that they can only see the jobs and/or applicants assigned to their area of management. The beauty of an online employment application is that many systems will allow you to have multiple versions of your employment application to accommodate different hiring scenarios. For example, you may wish to have two external applications…one for exempt-level hires, and one for non-exempt positions. Or, you may have certain hard-to-fill positions where you struggle to get top talent to spend the time to complete your entire application at the onset of the process. In these situations, having a two-step application tied to those challenging job openings can have a big impact on the number of applications you receive. Lastly, if you have a fair amount of employee transfers internally, then you may wish to utilize an internal employment application that is much more condensed compared to your standard external application. Know your preferences at the start of implementation so that you can quickly describe the application questions you wish to use in each scenario. Also, make sure you test all of your employment applications (as if you were an applicant) so that you can spot and rectify issues or recognize a poor candidate experience before you launch the new system. A next-generation applicant tracking system will give administrative-level users access to add and edit their own settings throughout the system at any point in the future. However, if you really want to make the most of the customization support offered to you during implementation (and save yourself some busy work), then respond quickly when your partner offers to build out pieces like status codes (dispositions), business unit labels, user login credentials, employment type options, email template text, etc. on your behalf. I think one of the most advantageous features offered by many ATS solutions is the ability to automatically score and/or filter applicants based on their responses to multiple choice screening questions that focus on content like desired income, certifications held, number of years of experience and willingness to travel, for example. And while this feature is often a strong selling point for prospects, the truth is that I’m often disappointed when I see so few clients taking advantage of the feature despite our team’s urging during the implementation process. Work with your interviewing team for various positions to discover which questions asked during an interview might be more appropriate during the application stage. Screening questions, when appropriately evaluated, have the potential to save recruiters a ton of time that would have otherwise been spent looking through applications of people that fail to answer “deal-breaker” questions favorably. The challenge with pushing position listings to external job boards is that every job board is different. They all have different requirements in terms of the information required, and unless you are paying extra for a posting service or network…you have to push job listings to these boards separately by yourself. Enter an ATS and it’s likely that this manual task is no longer required on your part. However, the vendor partner you use will be much more effective at setting up your jobs to post externally if you can provide that team with information for your main point of contact at various boards. Or, in the case that an ATS has an integration built with a job board, then hearing information about your objectives in using that board can help the vendor team to quickly enable the feature(s) most appropriate for your organization’s needs. While most applicant tracking systems come equipped with a series of standard reports, some also include the ability to create and run your own on-demand data. This particularly comes into play should your organization be subject to any compliance reporting such as with affirmative action applicant flow logs. Knowing which fields of data you will require in your report (and in what order) ahead of time, will allow your vendor support team to quickly build a report exactly to your specifications so that you may hit the ground running that much more quickly. If your company is passionate about brand consistency and particular about pantone colors, then involve members of your marketing team in the ATS implementation process when it comes to branding your external applicant portal. Ask your partner for information about site design capabilities and a style settings guide that you can share with marketing. This will help to cut down on the number of changes required from the time the vendor first presents you with the customized portal’s appearance to the time the finished product goes live. Spend some time mulling over whether any parts of the recruiting process are currently sluggish. If your time to fill statistic is less than desirable, then you may have an opportunity to shore up some manual tasks with technology via your new software solution. For example, if your organization requires multi-layer management approval before a new job can be posted, but the internal paper form is sitting in someone’s desk tray for days, then now is the time to ask about whether the job requisition management feature of recruiting software could be customized for your needs. If so, then be ready to discuss what type of information is required for a new requisition request, and who should be on the approval string for various job categories. It’s likely that you’ve already discussed the availability of a specific software integration with your vendor by the time you are ready to start implementation. However, to make the execution of that arrangement as smooth as possible, convey the specifics of your arrangement with that third-party vendor with your ATS vendor early in the process. This will allow your vendor partners to independently test the integration once it is set up for your site, and work out any bumps before you attempt to push live applicants to other applications that deal with things like onboarding, payroll, employee assessments and background checking. Take advantage of the chance to play around in your job portal before it starts accepting live applicants at the close of your implementation process. This seems like a no-brainer; however, HR professionals are known to have unexpected projects and emergencies dropped onto their plates…and so sometimes the best intentions turn into “I didn’t have a chance to look at that yet but let’s go ahead and do training.” You will set yourself up for the best chance of successful adoption if you make time to “drive” before and after your basic training session. By experiencing the tool first-hand and then launching it in the near future after that practice, you will be more familiar with the features and retain what you learn into the future. If there are other recruiting process objectives you have in mind, don’t be shy about asking your vendor to discuss and/or point you in the direction of documentation that showcases all the bells and whistles of the ATS. Such icing on the cake features might include custom surveys, reference checking, automated employee referral links and incomplete application reminders to name a few. While you may have the best intentions to look at adding those items in the future, time often gets away and it may be more productive for you to be ready to implement them now. While there are often many moving pieces to implementing an effective applicant tracking system, if your vendor is organized and supportive you should have no trouble configuring the software to help your business achieve its recruiting outcomes. Jessica Stephenson, PHR, SHRM-CP, passionately works at the intersection of content marketing and HR technology. She is Vice President of Marketing and Service Operations for ExactHire, a software firm that helps small- and medium-sized companies automate and improve the hiring process. Follow Jessica on Twitter @JessLStephenson and ExactHire via @goExactHire.